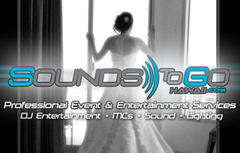 Look no further than Sounds To Go Hawaii DJs to un-complicate your search for DJ entertainment. We are professionals in the DJ entertainment industry and will work closely with you from day one to make your wedding planning process fun and simple. You have other things to worry about, so let us take care of the rest for you. At Sounds To Go Hawaii, it's all about you! Absolutely the best choice we made! Laurence of Sounds To Go Hawaii was down to earth and just took the stress out of our planning. The evening was unforgettable...timing from the introductions to the first dance. He was on top of everything and took care of last minute changes with a smile. OUR GUESTS WERE DANCING ALL NIGHT! Uplighting was spectacular. The mood was set with our color scheme and added that wow factor.